Politicians handed out $719 million on Friday. The list includes pump station upgrades, airport apron widenings, and dike foreshore improvements. The money will cover such worthy projects as arena heat recovery in Hudson’s Hope and a sewage detention lagoon in Mackenzie. It will build a slo-pitch park in Kamloops and libraries in Surrey and on Salt Spring Island. On Galiano Island, highways will be resurfaced, while in Victoria the First Peoples Gallery at the Royal B.C. Museum will get an upgrade. Of the 174 projects announced for British Columbia, only one is likely to find itself on the cover of a glossy magazine. (A magazine other than Water Meter Installation Monthly or Infrastructure Projects Quarterly, that is.) 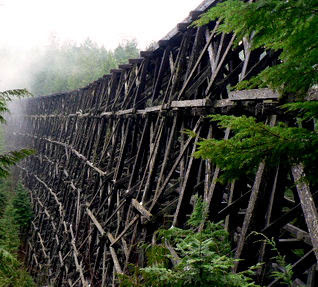 The federal government is kicking in $1.9 million to restore the picturesque Kinsol Trestle, a sum matched by the province and the local government. For many years, a dedicated band of history fans, railway enthusiasts and civic boosters in the Cowichan Valley have campaigned to preserve a bridge magnificent in its construction and spectacular in its audacity. The trestle spans a wide canyon at the bottom of which flows the Koksilah River, which carries trout, salmon, and summer steelhead. The Tinker-toy construction stretches 614 feet (187.2 metres) at a height of 145 feet (44.2 m), about the same as a 14-story building. A horizontal curve of seven degrees adds a graceful note. Imagine building for a toy train a trestle stretching across an inground fish pond using matchsticks and you get an idea of the boldness of a span for which construction was completed in 1920. The trestle is looking hard done by these days. The last train crossed 30 years ago. It survived a fire in 1988 that damaged some of the deck and supporting structure. It is a rickety hazard, for the time being at least. The money raised from government and private donations will rehabilitate the old trestle. The structure will be reinforced and unsound timbers replaced. A pathway will be built for cyclists, pedestrians, and horseback riders across the trestle. Each end will be landscaped, while a trail will be hacked through towering Douglas firs to the valley floor. Some of the work will be done through donations. Western Forest Products has offered trees, which will be selected and cut at the company’s sawmill. The forestry union is offering skilled labour to the project, a fitting contribution considering the original structure was put together by local farmers and loggers. The Koksilah River Trestle, as it was officially named, was constructed by the Canadian National Railway as part of a rail line that became known as the Galloping Goose for the noisy and ungainly passenger car that serviced logging and mining hamlets. Local residents referred to the trestle as Kinsol, taking the first letters of the nearby King Solomon copper mine. A river flood caused serious damage to the trestle in 1931, but it was repaired and reinforced. After the Second World War, trucks came to replace trains as the method of hauling logs and the rail line no longer was as important to the local economy. 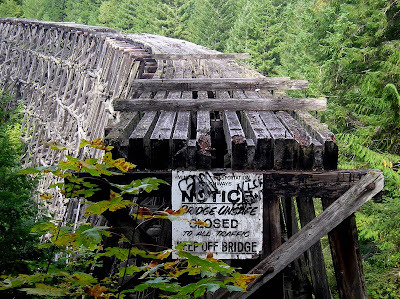 The last repairs were done to the trestle in 1974, six years before it was abandoned. The province acquired the CNR right-of-way in 1984. In recent years, the trestle has deteriorated so that officials either had to rebuild, or dismantle it, lest it fall into the river it spanned. Some, such as former Lake Cowichan mayor Jack Peake, who himself spent six years in the railroad industry, thought the trestle could be an historic landmark and tourist attraction. It is believed to be the tallest free-standing wood structure in the Commonwealth. The campaign to rehabilitate the trestle means an end to a 10-kilometre detour over the river for those following the 120-kilometre Cowichan Valley Trail. The repaired crossing, scheduled to open in 2011, will also close a missing link in the Trans-Canada Trail between the town of Lake Cowichan and the north end of Shawnigan Lake. It was a gap in a footway that is to extend 21,500-km, linking every province and territory. Alas, the rehab will not allow trains to return. The last crossed the trestle in 1979, ending six decades of freight and passenger service. On the rebuilt trestle, the only trains will be those carried by brides as they pose for formal wedding photographs in a spectacular setting.